OnTESOL offers free job placement in Thailand with the leading provider of English education programs. Qualified candidates can apply to teach in public or private schools throughout Thailand with BFITS. BFITS is hiring English teachers for Language Arts classes grades 1 to 6 and English Literature & Grammar classes for grades 7 to 12. BFITS is hiring math teachers for Pre-Algebra grades 7 and 8, Geometry grade 9, Trigonometry grade 10, Pre-Calculus grade 11, and Calculus grade 12. BFITS is hiring science teachers for Integrated Science grades 7 to 9, Biology grade 10, Chemistry grade 11, and Physics grade 12. 40,300 baht salary per month plus overtime. 12 month academic year contract that can be extended for additional years and additional benefits. 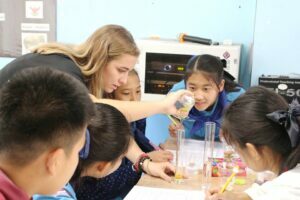 Apply to Teach English in Thailand! Class sizes range from 25-35 students per class with air conditioned classrooms, LCD projectors, Apple TV. Curriculum and lesson plans are already developed and provided to teacher. All teaching materials are supplied by BFITS in digital format on an iPad: Teacher Editions, Student Editions, Interactive whiteboard (pre-made PowerPoints), Learning Management System (LMS), etc. Classrooms equipped with LCD projectors , Internet, and Air Conditioning. Native English Speaker (Passport and Degree from USA, Canada, UK, Ireland, Australia, New Zealand). Bachelor’s Degree (preference given to degrees in Education, English, Math, or Science). One or more years teaching experience preferred (non-experienced teachers will be considered provided they have degrees specific to the content to be taught).